But when a young man, Adam Geraghty, walks into her office, claiming he needs Susanna's help but asking unsettling questions, she begins to fear that her secret has been discovered. Susanna Fenton has done very well for herself. Fourteen years ago started a new life. She is now a therapist and also has a teenaged daughter, Emily. Reinventing herself was an absolute necessity if she planned on keeping Emily safe. Is it all about to come crashing down? Adam Geraghty is a man with an agenda. When he meets his new therapist Susanna for the first time he has some bombs to drop. He is certainly not there for a listening ear. Adam has a series of questions that he poses to Susanna. The deeper the questions, the more unnerved Susanna becomes. At first glance, Adam seemed oddly familiar to Susan, although she had never seen him before. As they talk, Susanna's carefully-crafted life apparently falls apart right in front of her very eyes. The crux of the matter? Eventually Emily's picture and her voice on a cell phone destroy the very fiber of Susanna's being. Susanna doesn't know where Emily is. Adam does. And he is not about to make anything easy for her. 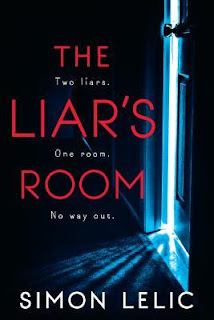 The Liar's Room is a drama-filled story that is slowly unfolded by bringing the past and the present together. All Susanna wants to know is whether or not Emily is safe. She will do anything to do what she can to protect Susan, but she quickly realizes that she must ask Adam precisely the right questions. We learn quite a bit about Susanna, Adam and Emily, and how the latter two met. What is revealed is utterly shocking and extremely disconcerting. This was a very tense read! Where was Emily??? What would the end result be? Why did Susanna start a life over again, keeping her past a secret? All of this was revealed and I was definitely kept guessing throughout. The conclusion came rather fast and was a bit surprising, if not a bit fantastical. However, the fact that I could not put it all together. What made this book work for me was that not only had Adam completely unnerved Susanna, I was as well. It goes without saying that it ended up being questionable who was the biggest liar, Susanna or Adam. I am glad to say that I enjoyed this book. I am definitely interested in reading Simon Lelic again in the future. Many thanks to Berkley Publishing Group and to First to Read for this ARC to review in exchange for my honest opinion. Sounds like a good thriller! 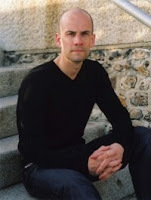 I've never heard of Simon Lelic before, but this books sounds interesting enough to add it to my TBR! Thanks for sharing. This is new to me also. Might check it out. Great review, sad to say I really didn't enjoyed this book that much it was just ok for me, but I think I was not in the right mood for it. I am really glad and happy that you enjoyed reading it though Robin, thank you so much for sharing your awesome post.